Please note: To access Online Performance Reviews (OPR), the Assessor must have an activated eSS account. If an Assessor is not an existing enable Self Service (eSS) user, the first time they are assigned as an Assessor, they will automatically receive an email asking them to register for eSS. Types of Assessors: "Primary Assessor" is typically the employee's direct Manager. "Additional Assessor" is another Manager, Team Coordinator or peer for example. Both Assessors complete the Online Performance Review process as per the below steps for the selected employee. The "Performance Appraisal Summary" report is however only sent to the Primary Assessor and employee. The names and feedback provided by the employee and all Assessors will be displayed in the report. For more information, please refer to this article: Types of Assessors & Online Performance Reviews. How do I complete Online Performance Reviews for my employees? 1. As an Assessor, you will be prompted to complete an assessment of the performance of selected employees. OPR is typically set up by the HR function and we encourage you to contact HR if you have any questions about the staff you have been asked to review. To begin, please login to enable Self Service. Once you have logged in, you will notice a new task in your inbox. Click on the "envelope icon" to navigate to your "Inbox". 2. You should be able to see a new task for the employee assessments. Please click on "View task". 3. Once you see the task details, please click on the "Performance Reviews" link to navigate to the reviews section of enable Self Service. 4. Select the relevant session to initiate the employee assessment. The "Overview" page will show you how many "Key Result Areas (KRAs)" you will need to assess. Click "First KRA" to get started. 5. Please select the relevant rating that best fits your assessment of the employee's performance in relation to the KRA displayed. You also have the option of including any justification or comments in the "Comments" section below. Click "Next" to proceed to the next KRA. 6. Repeat the above step until you have selected the outcomes for all the assigned KRAs. On the final "Submit" page, you will be able to review your submissions before finalising your appraisal. Please Note: You can easily edit your assessment by clicking on the relevant KRA. Once any edits are complete, you can easily return to the review page by selecting the "Review and Submit" button. 7. Once you are satisfied with the assessment, please click the "Submit your appraisal" button to finalise the employee assessment. REMINDER: After the review has been submitted, you can no longer edit the assessments. You can however access your completed review at any time by simply navigating to the ''My organisation'' tab and then click "Group performance reviews". You can view your responses by clicking on the "View details" button. When does the Employee and I receive the Online Performance Review report? 8. 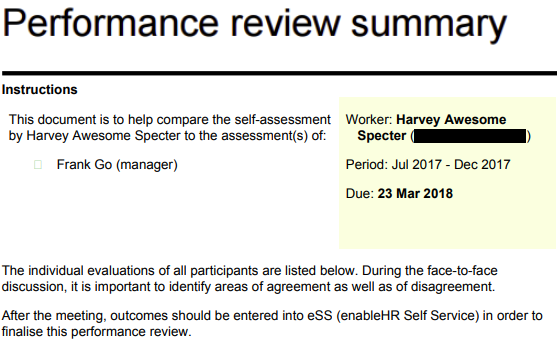 Via Email - Once you have finished the employee assessment, you will need to wait until the employee and any other Assessor/s have completed their assessment/s. Once all parties have completed their assessments in relation to the employee's performance, a preliminary report will be automatically generated and sent to your email inbox. Only yourself as the Assessor (the Primary Assessor) and the Employee will receive the report. Any "Additional Assessors" will not receive the report. 9. Via Self Service - You can also review the report from within enable Self Service. You will need to navigate to your "Inbox" in order to view the relevant new "Task" which will link you to the completed report. 10. Employee Notes - The Performance Review process for the Assessor follows the same process as the Employee. The only difference is that the Assessor can view any Notes as well as Operational and Strategic objectives that were flagged during the review period (if any) for further review and discussion during the current performance appraisal. These notes can be captured against the employee record or against a checklist for example. 11. Face-to-Face Meeting - The next step in the Performance Appraisal process is for you and any other relevant Manager/s to meet with the Employee face-to-face in order to discuss the ratings and comments contained within the"Performance Appraisal Summary" report. 12. Finalise the "Performance Appraisal Summary" Report - After this meeting, you (the Primary Assessor) will be prompted to go back into OPR to finalise the "Performance Appraisal Summary" report. You will prompted to detail any agreed final outcomes, correct rating/s and provide additional commentary as a result of the discussions in the employee's face-to-face performance review meeting. At this time, you will also be prompted to document any agreed current and future development objectives. To complete this process, repeat steps 1 to 7. 13. Once this has been completed, a final "Performance Appraisal Summary" report will be distributed to you and the employee. This will include all ratings, comments and objectives.